For those keen to get a sense of the English countryside without straying outside the M25, the North Downs Way is a fantastic long distance National Trail which covers 153 miles of English Countryside, including a beautiful stretch just inside the London Orbital. 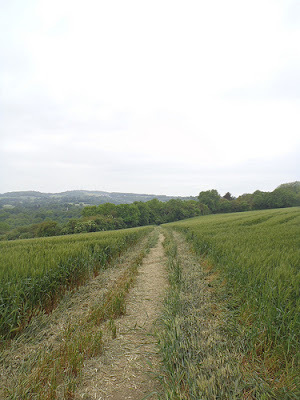 From where the path crosses the motorway near Merstham, it passes through around 15 miles of stunning countryside passing along the ridge of the North Downs along ancient trackways where once pilgrims walked on their way to pay tribute at the shrines of Canterbury. Though the path remains close to the motorway, it is very much an unseen and unheard presence, before the path dips back over and sets off into the English countryside towards Canterbury and Dover. Decades ago, I lived in Britain for a few years and loved it. But I don't remember the Downs in great detail. How wrong was that! Now in the blog I am continually making literary and art history references to the Downs. You're right about this! Definitely gets a recommendation. The North Downs Way is full of surprises. Clouds of copper and blue butterflies on the slopes overlooking Guildford; getting lost in a field of tall corn when the path peters out half way across, and you realise you can't see a fence or a gate anywhere in what feels (for a couple of minutes) like the middle of a prairie; tiny isolated churches, avenues of tall trees; and the wonderful surprise of finding yourself at the end of a field, overlooking the sea, and realising you're at the top of those famous white cliffs of Dover - or at least, just half an hour's walk from there. It's not a great wilderness walk like the Pennine Way or Offa's Dyke, but it's a classic none the less. I've only done it twice... must do it again! London based walkers might also like the Thames Path (http://www.nationaltrail.co.uk/thamespath/) and London Loop (http://www.walklondon.org.uk/route.asp?R=5)but my favourite is the Three Forests Way, (http://www.ldwa.org.uk/ldp/members/show_path.php?path_name=Three+Forests+Way) which goes from Epping Forest to Hatfield Forest - wonderful woodlands where you can practically not fail to see deer crossing your path.